Further analysis into the UFC-ESPN+ deal and what it means, a preview for tonight's SmackDown, WrestleMania card is growing, Flip Gordon cleared to return, Impact-OVW announcement & more. **Monday’s edition of Rewind-A-Raw is up on the site with guest co-host Garrett Gonzales of the Wrestling Observer website and Fight Game podcast. We reviewed Raw from Chicago, discussed the WrestleMania build up and had a big discussion on the UFC-ESPN+ deal. **Tonight, I’ll be joined by Brian Mann for Rewind-A-SmackDown as we review the show from Indianapolis featuring the Kofi Kingston Gauntlet match and the overall build up to ‘Mania with Brian’s thoughts on the card. Plus, we will go through the day’s news and take your feedback at the end of the show. **On the Double Shot for members of the POST Wrestling Café, I will be solo tonight going through Being the Elite, Road to Double or Nothing, quick thoughts on Impact and MLW Fusion, and a review of Total Bellas in Wai’s absence. This show will be up late tonight for Patrons. **On Wednesday, we will have a new edition of the British Wrestling Experience coming out with Martin Bushby and Benno joined by Jamesie to chat their in-person experiences at OTT’s Scrappermania 5 and wXw’s 16 Carat Gold tournament. **I’ll also have an MMA themed show out Wednesday chatting all the latest news with New York Ric of ESPN. **Monday’s episode of Raw averaged 2,695,000 viewers and was a drop of 4% from last week. The show reverted to the usual pattern with the first hour doing the highest of the three with 2,810,000 viewers. It fell to 2,717,000 in the second hour and experienced another drop to 2,559,000 in the third hour. It was their lowest number since February 11th. I feel Roman Reigns was a major factor for the show’s viewership over the past two weeks with the announcement he would be cleared and last week’s build-up to his match with Drew McIntyre, which turned into an angle. While Reigns was not on Monday’s show, it was reasonable to expect he would be showing up for the final segment involving the match between McIntyre and Seth Rollins. Raw’s viewership one year ago this week was 3,310,000 and that represents a drop of 18.5% year-over-year. **It was officially announced on Raw that the Andre the Giant Memorial Battle Royal will be part of WrestleMania, as we reported on Monday. Braun Strowman is the first entrant into the men’s battle royal. There is also scheduled to be a women’s battle royal as well as more title matches on the show. The plan as of Monday was for at least three more with the United States, SmackDown women’s, and SmackDown tag title match at WrestleMania. The winners will meet Saturday in the semi-finals and the final is on Sunday from Niigata. **Total Bellas dropped 10% this past Sunday with an average of 395,000 viewers on E! This would be the lowest number in the history of the series, just falling below the February 10th episode this season that did 396,000. The season finale of the show is this Sunday. E! will be launching Season 2 of “Miz & Mrs” on Tuesday, April 2nd. **Brandi Rhodes spoke to Muscle and Fitness about the all-inclusiveness that All Elite Wrestling wants to provide as an alternative. Rhodes added that females in the industry typically have shorter careers and with AEW they want to create an environment where women have roles within the company long after their in-ring careers. **Flip Gordon has announced he is cleared to return after suffering a full MCL tear back in January during a match with Tracy Williams. Gordon avoided having surgery and was able to rehab the knee. **Ace Romero will take on Josef Samael at the MLW Rise of the Renegades card on Thursday, April 4th, at the Melrose Ballroom in Queens. **The WWE stock closed at $89.40 on Tuesday. **Impact Wrestling and Ohio Valley Wrestling has resurrected their working relationship with OVW serving as a developmental group for Impact. The two sides had previously engaged in a similar relationship from 2012-2014. The two sides recently worked together to tape a One Night Only pay-per-view special from the Davis Arena in Louisville, Kentucky. **DEFY Wrestling returns to the Hawthorne Theatre in Portland, Oregon on Saturday, April 13th with a rematch between Jimmy Havoc and “Ravenous” Randy Myers. **The magic behind WWE’s camera operating style. **Bet Online has released early odds for WrestleMania. Seth Rollins is a -250 favorite over Brock Lesnar, Becky Lynch is a 1/5 favorite to win the Raw women’s title, Randy Orton is listed at -165 over AJ Styles, The Miz is a -400 favorite over Shane McMahon, and Triple H is -250 against Batista. **The impact of the UFC’s deal with ESPN+ cannot be understated and is a massive story. Long-term, it’s impossible to forecast how this deal will turn out for ESPN without knowing the financials of the two-year extension and the right to become their exclusive U.S. distributor of pay-per-views. For the UFC to give up that enormous profit center of pay-per-view for a smaller universe of ESPN+ subscribers, it had to be an offer they could not refuse. It does change the UFC’s structure of pay-per-view because once you take the licensing fee ESPN is paying, it’s guaranteed income from the UFC regardless of how that pay-per-view performs on the platform. Obviously, a strong pay-per-view means more revenue for both ESPN and UFC to split, again, terms are not disclosed regarding that split. There is tremendous value for the UFC from the guaranteed income, the extension of their relationship with ESPN through 2025 and being further entrenched as business partners meaning ESPN will be pushing UFC with all their resources because of the added investment. For the fighters, this is the latest example of a massive industry-changing move where they don’t have collective bargaining or will share in this found revenue. If you’re a champion that had pay-per-view points, this is a risk because there is going to be a steep migration period going from traditional pay-per-view and adding a new paywall in ESPN+, which had just passed the 2 million subscriber mark. ESPN is going to want the major drawing cards in Conor McGregor and Jon Jones fighting on the service to expedite fans on the fence about signing up, but those fighters have an expectation of what they will be paid through pay-per-view revenue and should be fighting for higher guarantees in this new world. Consider that McGregor and Khabib Nurmagomedov did more buys on pay-per-view last October than the total number of ESPN+ subscribers. If McGregor wants a guaranteed purse based off what he would be paid for a 2 million buy fight it’s not like the UFC can expect 2 million buys on ESPN+ out of the gate. That said, the UFC is being paid an enormous amount that they can pay whatever they want and there will be an expectation from ESPN for the biggest fights to be made. While some have compared this to the WWE Network’s launch in 2014 and moving their pay-per-views to the platform, it’s a totally different deal. WWE moved all their shows to a service that cost $9.99 per month in the U.S. and included the pay-per-view events. This deal is asking subscribers to spend $4.99 per month just for the ability to spend an additional $59.99 each month on top of the fact the UFC is being paid an enormous licensing fee from ESPN to become the exclusive distributor. The WWE did not have any of that guaranteed revenue when they made the switch and it’s an interesting question if they had priced the WWE Network at $5-10 per month and then charged an additional $35-50 per pay-per-view and what segment of their audience would spend that amount. **Marc Raimondi at MMA Fighting spoke with the UFC’s chief operating officer Lawrence Epstein on the deal with ESPN+ and the changes to the U.S. pay-per-view industry. 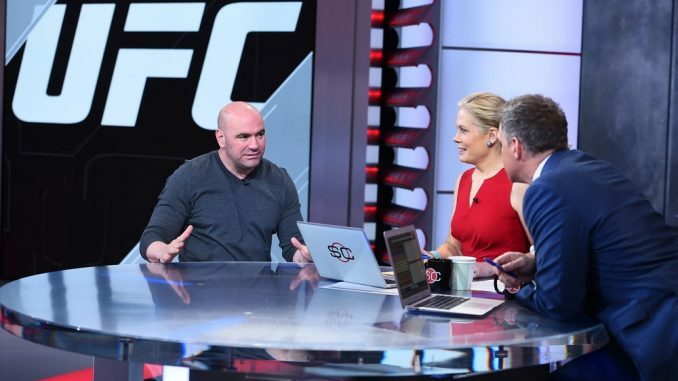 **In an interview with Megan Olivi for the UFC, Dana White announced he has signed a new seven-year contract with the company to stay on as its president. **Conor McGregor was in Chicago over the weekend and took part in the St. Patrick’s Day Parade in the city. He was interviewed by ABC 7 and stated he is in negotiations with the UFC for his next fight and they are aiming for July. **ESPN’s Ariel Helwani is reporting that heavyweight Derrick Lewis will undergo knee surgery next Tuesday. In a crazy story, his doctors have traced his knees injuries that include a torn ACL, torn MCL and meniscus to a February 2015 fight against Ruan Potts. Since defeated Potts in 2015, Lewis has fought 13 times and gone 9-4, including fighting for the heavyweight title last November. The report states he did alert the UFC of the injury prior to his recent loss with Junior dos Santos and he told he could go ahead and compete.